As a follow-up to Stacy's great list of flag facts,Â enjoy this six-pack of stories (one for each white stripe) about famous American banners flown around the world. Happy Flag Day, everyone! 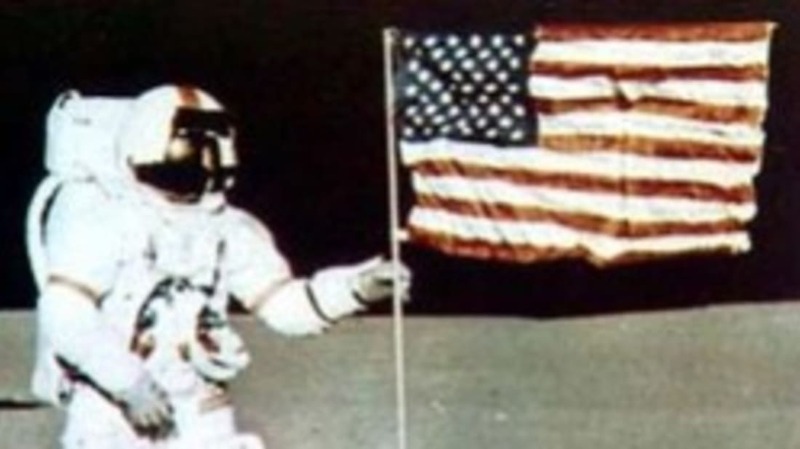 Few images are as iconic as that of Neil Armstrong planting the U.S. flag into the lunar soil when man first landed on the Moon on July 20, 1969. The identity of the person who actuallyÂ crafted the flag, however,Â isÂ disputed. According to some newspaper accounts, seamstress Dolores Black claims to have sewn it while working forÂ "the nation's largest flag manufacturer" in Milwaukee. Black says her boss approached her a month before the Apollo 11's launch, saying he'd been contacted by NASA about sewing a special flag, and he assigned Black, his senior seamstress to the task. However, an official NASA press release dated July 3, 1969, the flag taken to the Moon had been purchased from Sears and retro-fitted with the special aluminum staff and crossbar tubing. Annin & Company, whichÂ was the largest flag manufacturer in the U.S. at the time - and which does not have a plant in Milwaukee -Â was the supplier of flags to the Sears department store chain. Even if the next set of astronauts to land on the Moon located the flag (which Buzz Aldrin says blew over in the rocket blast when the team left the Moon), 40 years of being exposed to the Sun's ultra-violet rays would have most likely bleached away not only the stars and stripes, but also the signature Black says she left underneath the webbing. When retailer J.L. Hudson first opened his department store on Woodward Avenue in Detroit in 1911, most "experts" scoffed, predicting imminent failure because the store was located too far from the heart of downtown Detroit. Contrary to the naysayers gloomy predictions, Hudson's (and the area around the store) soon became the new heart of the city. The store was the first non-industrial setting in the U.S. to install air conditioning, and it became the place to go at Christmas time, withÂ a holiday lightÂ display comparable to thoseÂ employed by Macy's in New York. On Armistice Day in 1923, Hudson's unfurled the world's largest U.S. flag along the building's face. The flag was revised a few times afterward to reflect the admission of new states. In 1960 six seamstresses added the two stars (each one measured six feet across) representing Alaska and Hawaii. TheÂ historic photo and film footage of the American flag beingÂ raised at Iwo Jima actually shows the second flag erected on the Japanese island. The U.S. had sufferedÂ more thanÂ 4,500Â casualties duringÂ its 1,000 yard advance to capture Mt. Suribachi. Lt. Col. Chandler Johnson ordered a patrol up the mountain and handed Lt. George Schrier a 54"Â x 26" flag, saying "If you get to the top, put it up. "Â Schrier's 40-man patrol snaked its way up to theÂ mountain's summitÂ and propped up Old Glory with an abandoned piece of drain pipe and some rocks. Sensing a historic moment,Â the colonelÂ sent an assistant to fetch a larger (96" x 54") flagÂ that hadÂ flown uponÂ one of the ships bombed at Pearl Harbor.Â Johnson handed it to Pfc. Rene Gagnon and ordered him to replace the original, smaller flag, "so every son of a bitchÂ on this whole cruddy island can see it." Associated Press photographer Joe Rosenthal snapped the Pulitzer Prize-winning photo of the second flag being raised. (photo courtesy flagpride.com) The flag patch on the right sleeves of some U.S. military uniforms may appear to be backwards, as do the decals on the right side of U.S. aircrafts and other vehicles. There's a perfectly legitimate reason for this, of course: flag protocol dictates that the Stars and Stripes should always be displayed as if the flag was flying in a breeze. This practice dates back to the earliest days of the U.S. Army, when one soldier was designated as the "standard bearer." As the standard bearer marched forward into battle, the flag would naturally unfurl behind him, away from the staff. The canton, or the area with the stars, should always be depicted facing forward. The Parade of Nations,Â now a traditional part of the Olympic opening ceremonies,Â was first added to theÂ program at the 1908 GamesÂ in London. AsÂ the teamsÂ passed the Royal Box,Â each nation'sÂ flag-bearer was expected to dip his nation's banner to King Edward VII. Ralph Rose, who was carrying the U.S. flag, refused to do so. As a proud Irish-American, Rose had no particular affection for the British anyway, but when questioned about keeping his nation's flag vertical,Â his reply wasÂ simple:Â "This flag dips for no earthly king." The U.S. flag bearers at the 1912, 1924 and 1932 Games weren't so staunch in their patriotism, and lowered Old Glory when passing the head of state, even though the "no dip" rule was part of the official Flag Code adopted in 1923. The United States was the only nation to not dip its flag while passing Adolf Hitler in the stands during the Parade of Nations at the 1936 Games in Berlin, and the tradition has remained steadfast since then. Flying the flag at half-staff is a sign of mourning, and only the president or governors of state can officially proclaim when the flag should be flown in this way. Local or national catastrophes are considered on a case-to-case basis, but certain protocolsÂ are alreadyÂ in place: If a president or former president dies, the flag is flown at half-staff for 30 days. When a vice-president, chief justice, or the speaker of the house passes away, they're remembered with 10 days of half-staff. In recent years, the chief executive has ordered the flagÂ displayed at half-staff to commemorateÂ theÂ passings away of civil rights pioneer Rosa Parks, Pope John Paul II, and the victims of both Hurricane Katrina and the Virginia Tech shootings.